The Rt. Rev’d Morris King Thompson, Jr. The Rt. Rev’d Morris K. Thompson, Jr., born in Cleveland, Mississippi in 1955, was elected diocesan bishop of Louisiana on December 13, 2009. His Consecration as the 11th Bishop of Louisiana took place on May 8, 2010, and he was enthroned on May 13, 2010, at Christ Church Cathedral, New Orleans, Louisiana. He served as the Dean and Rector of Christ Church Cathedral in Lexington, Kentucky from 1997 to March 2010. Prior to this position, he served as associate rector of St. James Episcopal Church in Jackson, Mississippi. Bishop Thompson has been an ordained minister since 1981, first in the Southern Baptist Church. In 1990, he was ordained a transitional deacon in the Episcopal Church and as a priest the following year. He received his M.Div. from the Southern Baptist Theological Seminary in Louisville with an emphasis in Pastoral Care and Counseling, and completed post-graduate studies at the University of Mississippi Medical Center, as well as post graduate work at Lexington Theological Seminary. Dean Thompson also has training in Clinical Pastoral Education, Grief/Anger/Loss Recovery and Appreciative Inquiry. 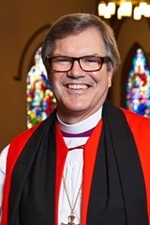 In the wider Episcopal Church, Bishop Thompson has participated in the pilot Clergy Leadership Program, the North American Deans’ Conferences and is a past member of the National Task Force on Spiritual Formation. He has also served as a deputy or first alternate at General Convention for the past three conventions. On a diocesan level in Lexington, Kentucky, he twice served as President of the Standing Committee, and was a member of the Commission on Ministry. He served on the Diocese of Lexington Long Range Planning Committee and was Chairman of Spiritual Formation Commission. He also served as an Education for Ministry (EFM) Mentor. From 1974 to 1976, he served in the United States Marine Corps. From 1985 to 1990, he was Director of Pastoral Services at King’s Daughters Medical Center in Ashland, Kentucky. Subsequently, he was Vice President of Mission at Our Lady Bellefonte Hospital, 1990 to 1992. Concurrently with his service at Bellefonte Hospital, he was Priest Associate at Calvary Episcopal Church, Ashland. Bishop Thompson and his wife Rebecca, both from Mississippi, have two grown children, Virginia and Trey. In his spare time, Bishop Thompson enjoys spiritual study, time with his family, cooking and outdoor activities, like golf.